Wednesday, February 20, 2013: Well, we are pulling out of San Diego this morning. However I would like to leave you with one more photo. 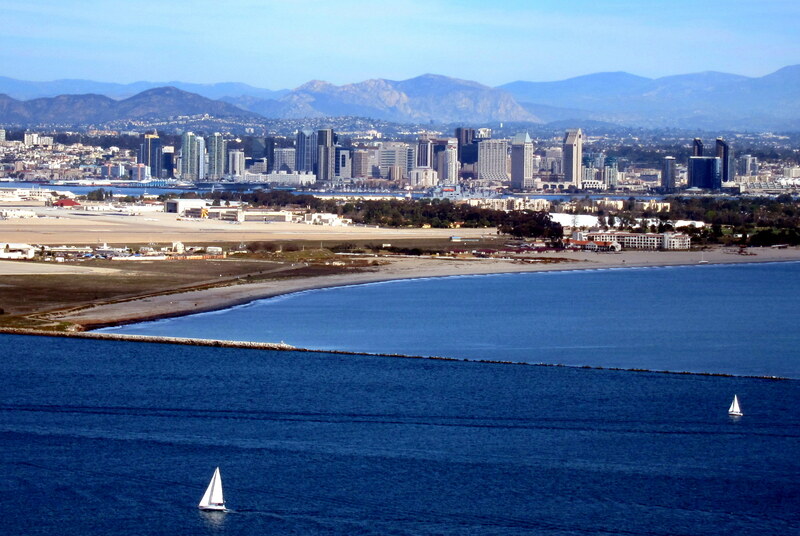 I really like this beautiful sunny cityscape with sailboats tacking into the bay, North Island Naval Air Station to the left and Coronado to the right with the downtown area backed by the Laguna Mountains to the rear. This is truly one of the world’s most beautiful cities! It should be noted that the crystal clear air that allows the incredible visibility across this southern California city of one million souls is a result of aggressive air pollution standards enacted a number of years ago. After a month and a half on the road, we deserve a vacation. So off we head on a close haul (like the sailing metaphor?) up the coast to one of our favorite beach camping spots. Since it is to be a short travel day and since you already know of our disdain for the interstate freeways, we decided to seek out old US Highway 101 for our venture north. Back in the middle ages of last century, this road was the only north-south conduit that one could use to travel along the California Coast. I can remember motoring with the family from San Diego to Anaheim in 1959 to see the brand new Disneyland Park. 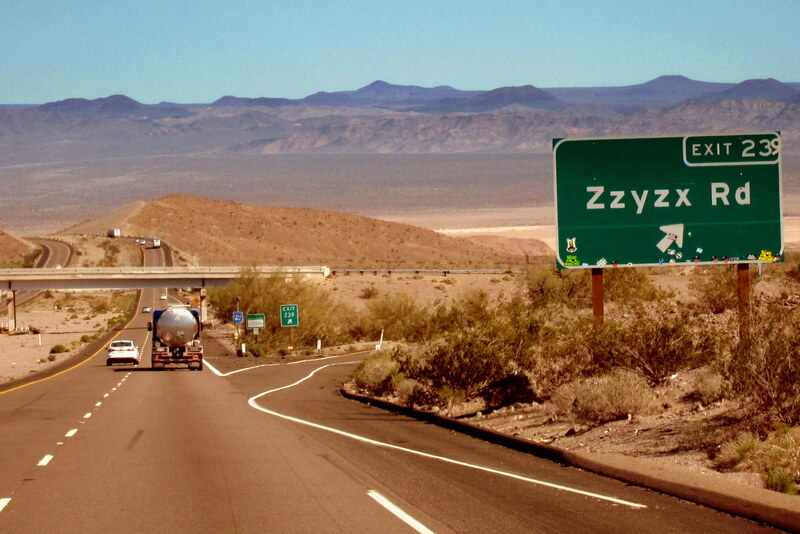 There were very few towns along the way, and those that did exist were quite small…..not so today! 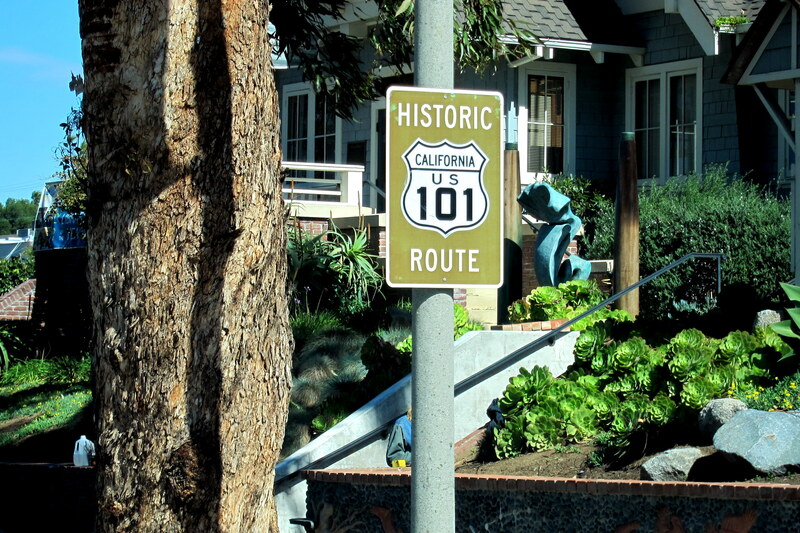 US-101 is still the most picturesque way to travel up the coast but it is now hard to determine when one town stops and the next one starts. 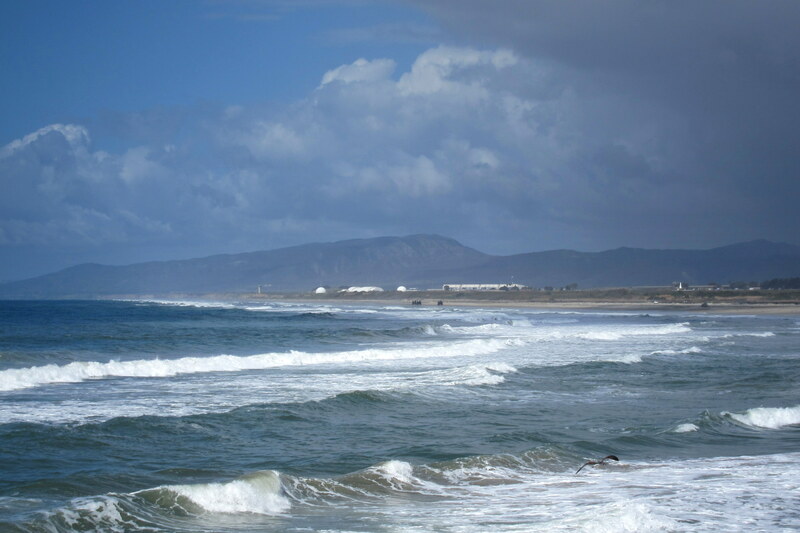 However, upon close examination, each coastal town is unique and begs for exploration. 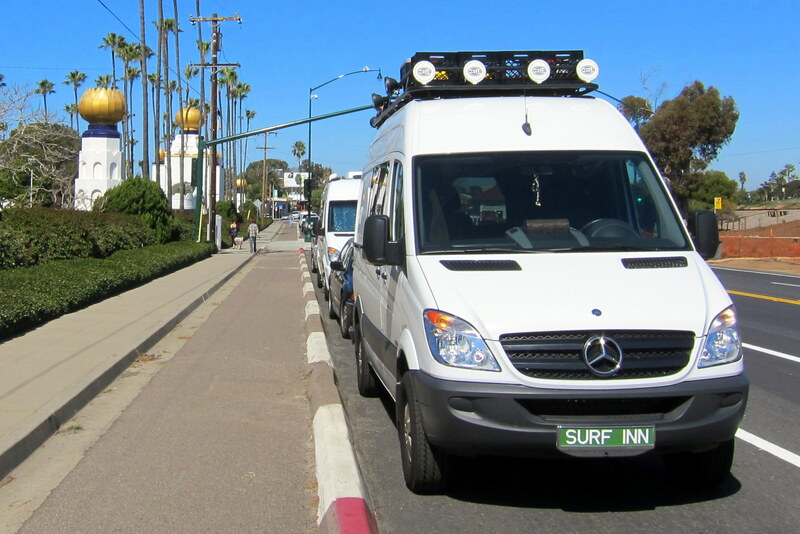 Since we have a 22 foot tow astern (yep, more nautical talk) of our 20 foot truck, we prudently decided to first set up camp in Oceanside, California and then spend the next few days poking along the coast. 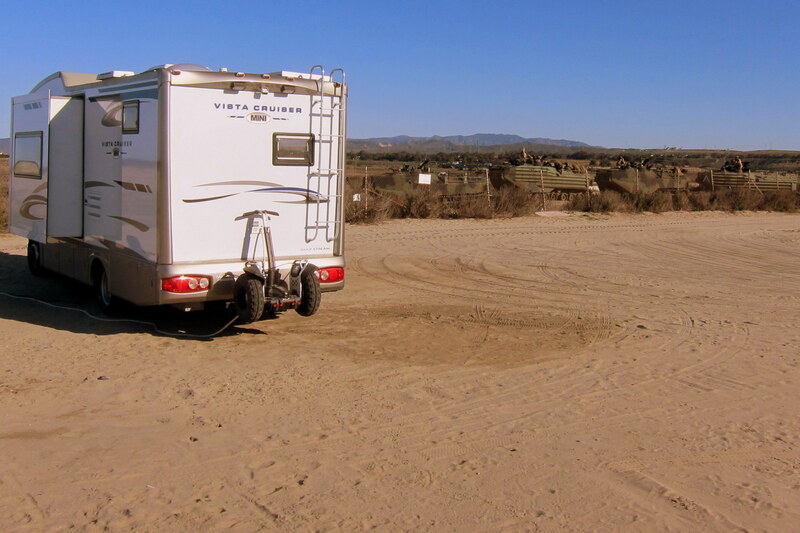 Soon we pulled into the camping resort on Camp Pendleton known as Del Mar Resort Campground and Villas. 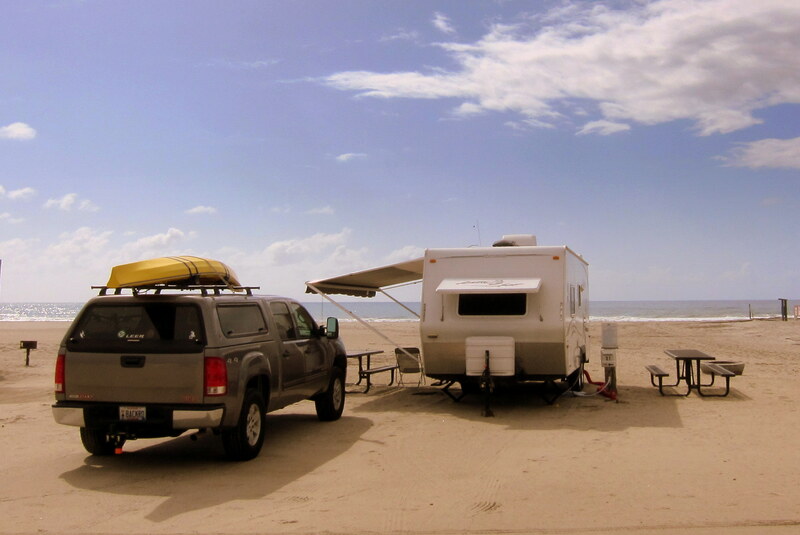 Being mid-week, we were able to score a nice beachfront camp spot with full hookups! After a stroll about the RV Park, down past the Villa’s and back along the surf line, we settled in our beach chairs with a tasty beverage in hand and watched the sun sink into the placid Pacific as USMC GU-11’s wheeled about in the still air. 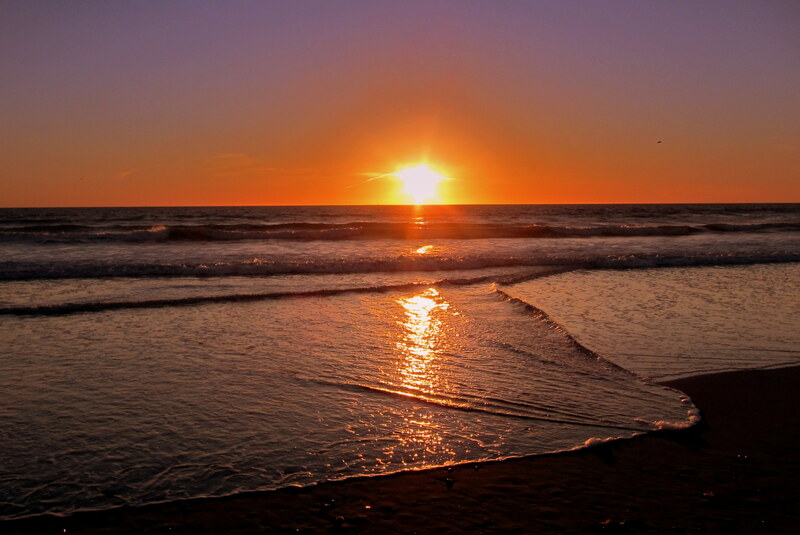 Thursday, February 21 through Monday, February 25, 2013-Oceanside, California: Well this morning, as usual, I was up early and got the coffee going. Then started Kit’s breakfast of eggs benedict and a pitcher of mimosa while she sits patiently in bed. Ok…..that last part isn’t true, but I do get the coffee made before ever so gently waking her for the day. 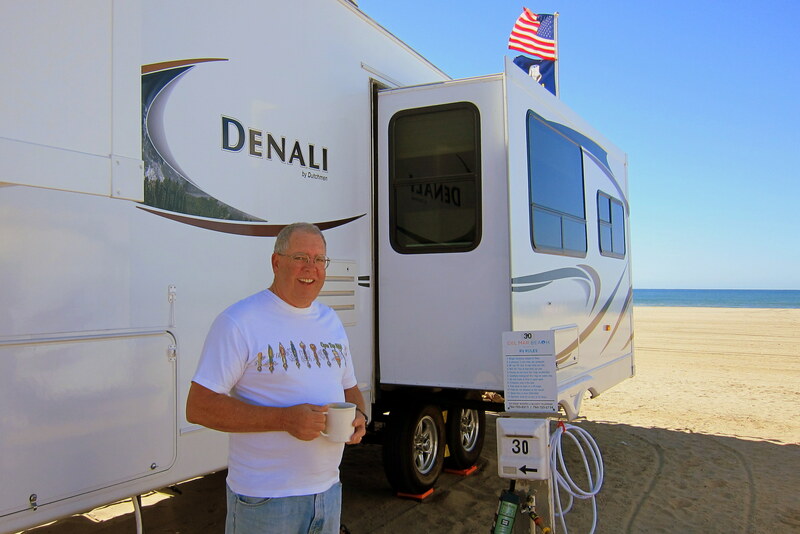 Sitting at our camper dinette, enjoying the ocean view and discussing the plans for the day, we were startled by a loud rumbling sound that made the ground shake. Knowing that California has a dangerous fault (Um, I think his name is Jerry Brown) we were a bit concerned until Kit looked out the far side of the camper and noticed that the Marines had landed on our little paradise! Oh yea…..now we feel better! There must have been a dozen of these tracked Amphibious Assault Vehicles (AAV’s) trundling past a mere 25 yards from our campsite! 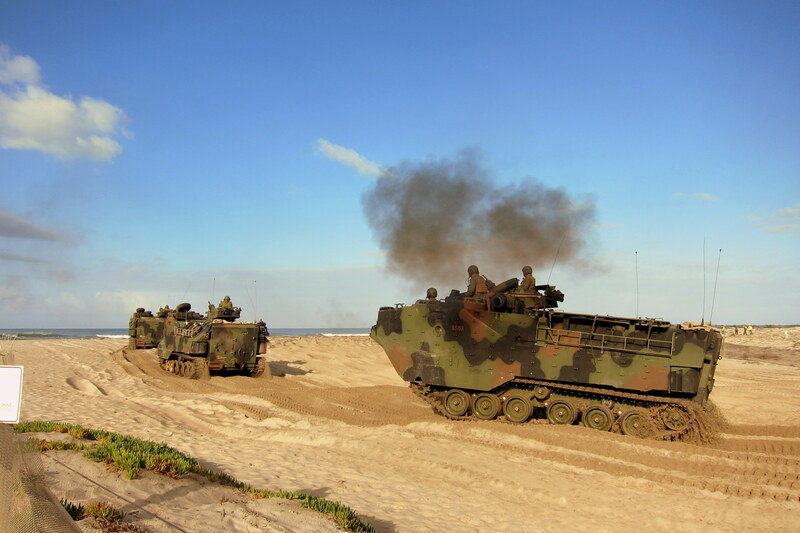 The AAV is a true amphibian that can be launched from a ship at sea, propel itself to shore and then drive many miles inland…..all while carrying 20 combat equipped Marines. Providing air support for today’s training exercise was a number of these unusual Marine Corps aircraft we spotted flying overhead. 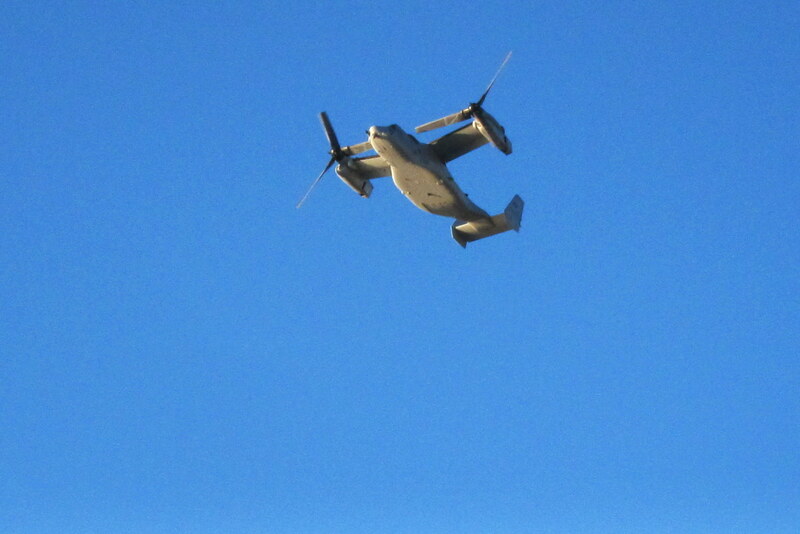 The V-22 Osprey is a tilt-rotor aircraft capable of vertical takeoff and landing like a helicopter when the rotor pods are tilted up, and sustained high speed horizontal flight in the orientation shown above. As I soon learned, Camp Pendleton is the premier Marine Corps facility for beach assault training and this spectacle of military hardware was to be repeated throughout our stay. 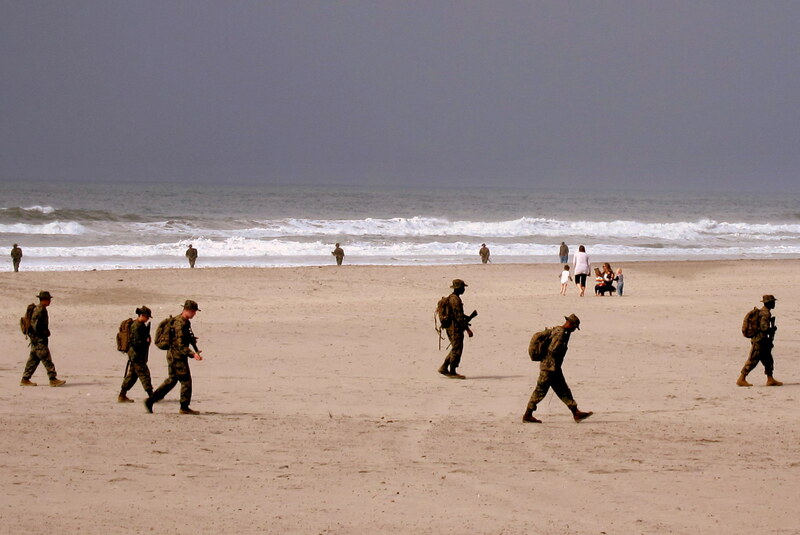 The beach assault training area encompasses 20 miles of coastline and is the last remaining undeveloped part of the California coast. 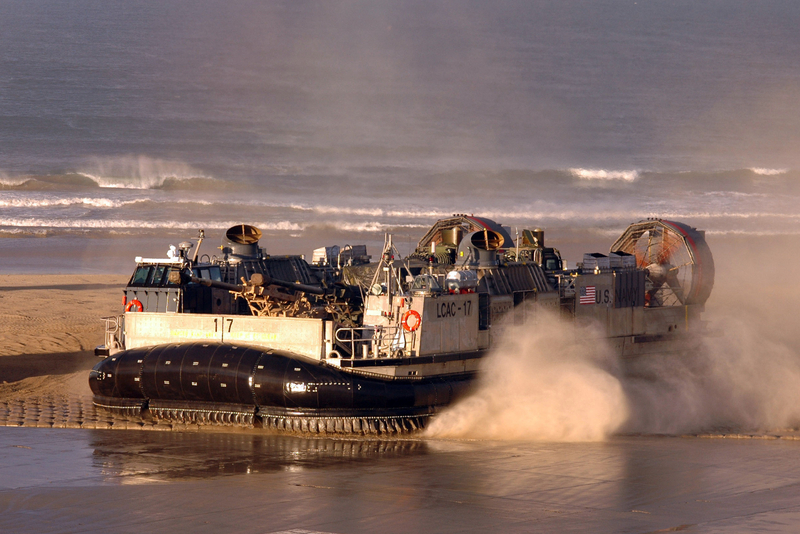 The white structures in the photo above are part of the base and house Assault Craft Unit Five (ACU-5) and their LCAC Hovercraft (noted later). This relatively unmolested stretch of natural California shoreline has developed into a haven for wildlife and is now designated as a National Wildlife Habitat. To further amplify that we were camping on a military base I noticed that part of the recreational beach was used for the ground forces to do their thing. Notice the civilians to the right of the photo above enjoying the spectacle. After being connected to the military in one way or another over 43 years I never tire of watching our tax dollars put to legitimate use, and enjoyed watching these daily training operations. For the six days we were on the beach, we did very little, as planned! 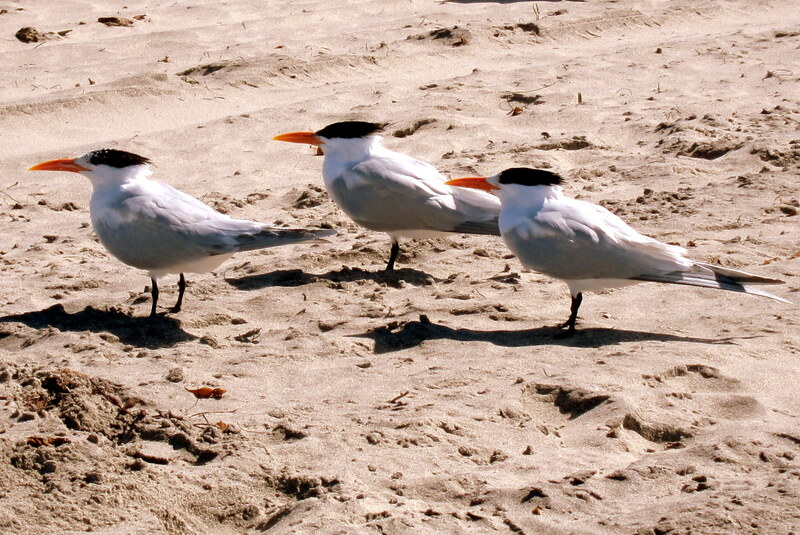 Our days were spent watching shore birds…..
…..and beachcombing, reading, relaxing and other enjoyable pursuits. 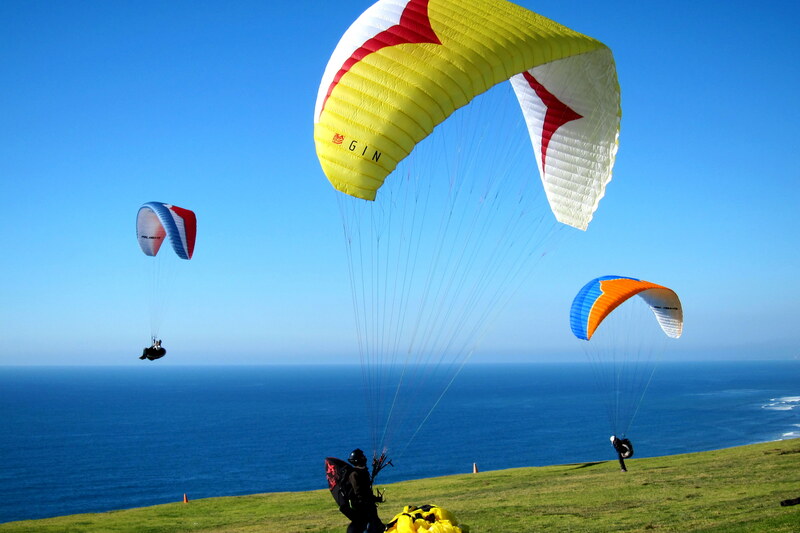 The above photo is of our latest acquisition….. a fully acrobatic, high performance stunt kite. 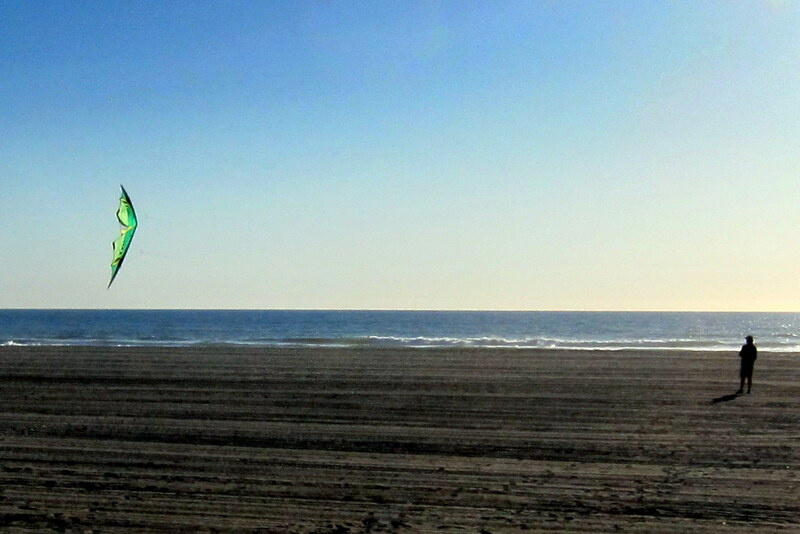 However the only thing acrobatic about flying this kite is me trying not to crash it into the sand at high speed! In the hands of an expert, this kite is amazing to watch. As noted, I now have a number of kites and one day while flying our 2.5 meter Para-foil kite, a seagull flew past, turned and circled the hovering kite before continuing on. I’ll never know what that bird must have thought seeing a brightly colored piece of nylon in its flight path. As one gets older one tends to enjoy watching the simple antics of birds. The existence of an adjacent wildlife refuge resulted in the proliferation of shore birds in the area…..a true bird watchers paradise! Such as these dudes from the 50’s with their “Ducktail” pompadours just nonchalantly sitting on the beach scoping out the chicks (pun intended) and ignoring any adult in sight. Ah, those were the days! I also noticed this hungry fellow. 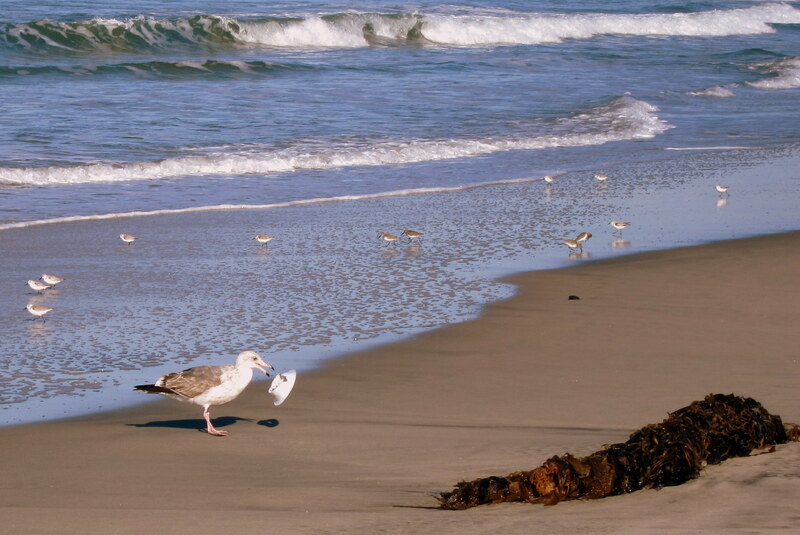 Normally, California Beaches are some of the cleanest around. However this foam bowl apparently got away from a picnicker and the Gull had pecked the entire bottom out in an attempt to get at the remaining food…..kinda sad, actually. I attempted to scare the bird away so I could grab the refuse but he took flight with bowl in beak. However the most entertaining birds by far were these Plovers. 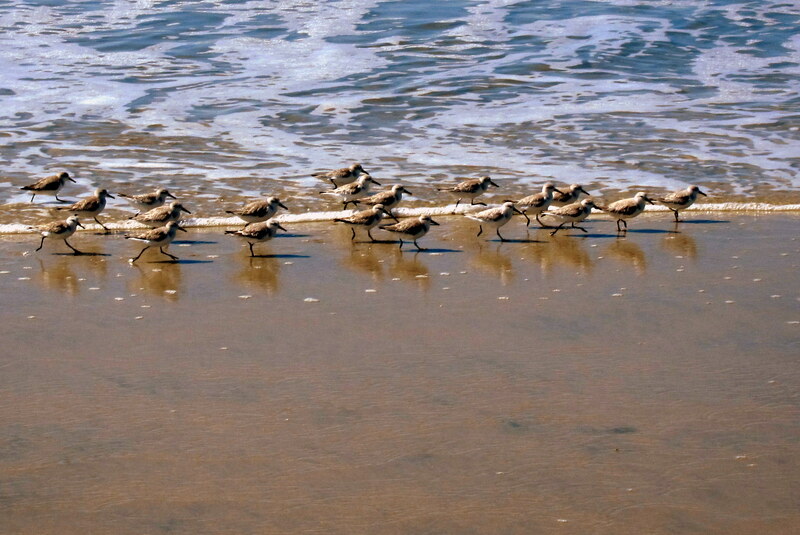 They would roam the surf line in packs and as the water receded they would race toward the newly exposed sand in search of any tiny morsel that had washed ashore. 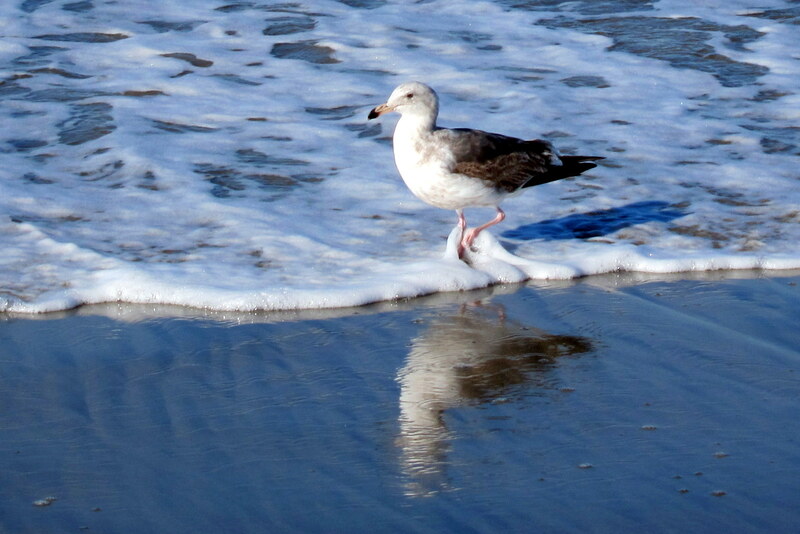 Then when the next swell would come in the birds would scamper to dryer sand while squawking in alarm. This humorous spectacle went on for a long time, usually at dusk. Here is a link to a short video I captured of their antics. See if you can tell what happened about half way through the film. Yep…..got my feet wet……shoes and all……and that water was cold! The Plovers were smart enough to escape the inrushing water, however not me. 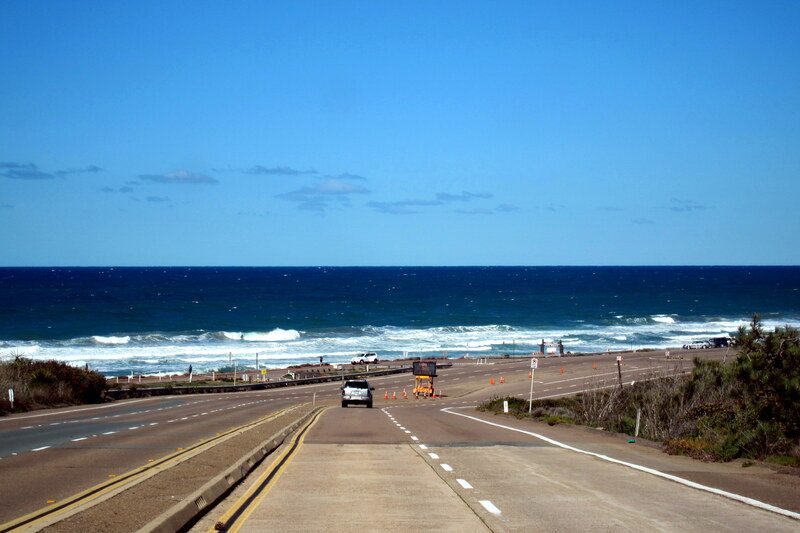 On yet another sunny day, we made a coastal trek south on US-101. 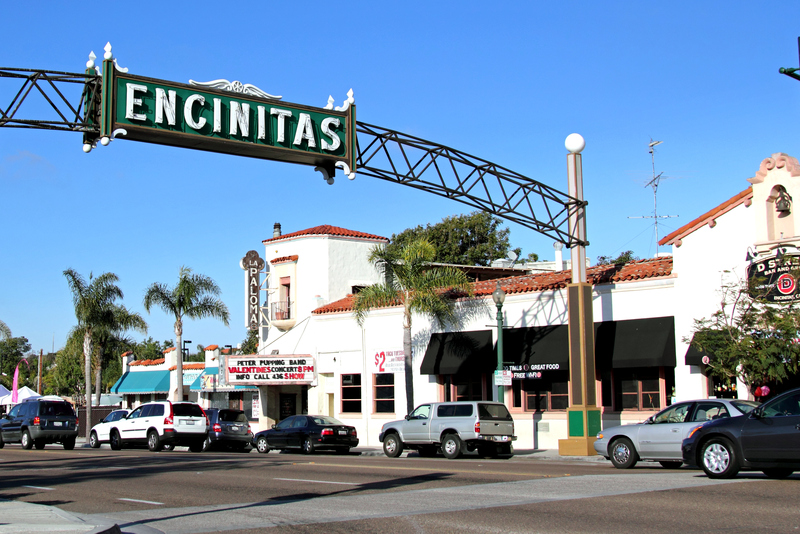 Kit had a hankering to explore the various village shops and I wanted to poke around some of the legendary surfing spots I remember as a teenager…..our first stop was in the little town of Encinitas. This quaint little (by California standards) town of 60,000 folks didn’t even exist back when we were kids. The main street is US-101 and as such gets a lot of tourist traffic and features a lot of tourist business to keep folks content. As Kit perused the retail opportunities, I made a beeline for Swami’s a short walk away. 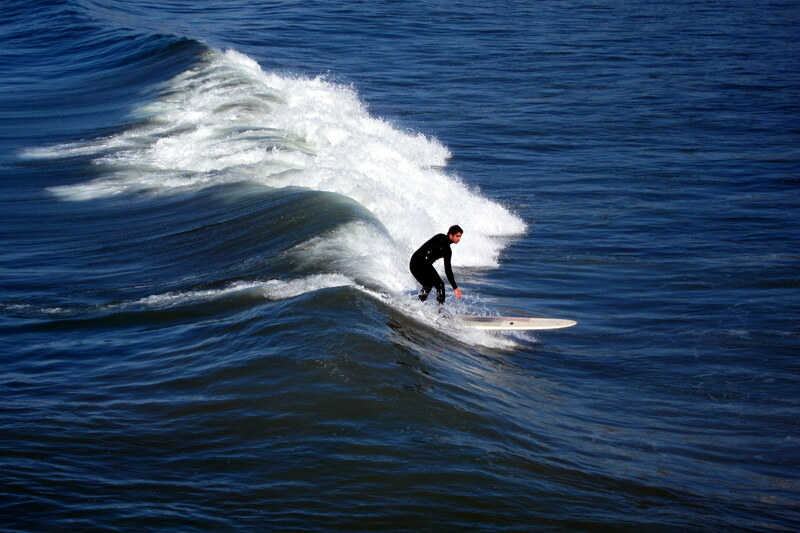 Which features some of the best reef point breaks in the area. 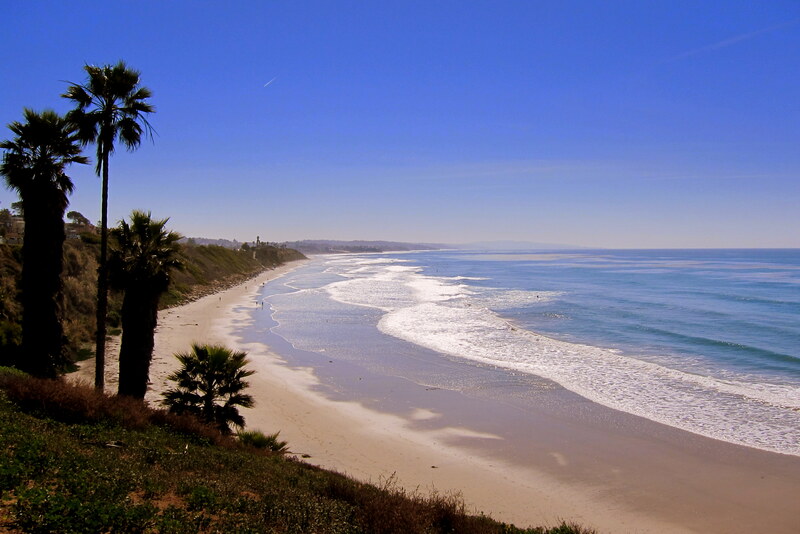 So, how did this typical California beach spot get the name Swami’s? Well, up on the bluff, overlooking the world class surf sits the Self Realization Fellowship Temple founded back in 1937 on what was then a lonely and isolated stretch of California coastline. The Indian (think dot on the forehead) style architecture prompted the local surfers to call the area Swami’s……the name has stuck, and is now officially known as such on maps and brochures. As in the past, parking in the area is at a premium so surfers just park on the side of US-101 and walk down the cliff to the beach. Check out these modern surf buggies parked in front of the temple…..much nicer than the beat up old station wagons we used to arrive in. 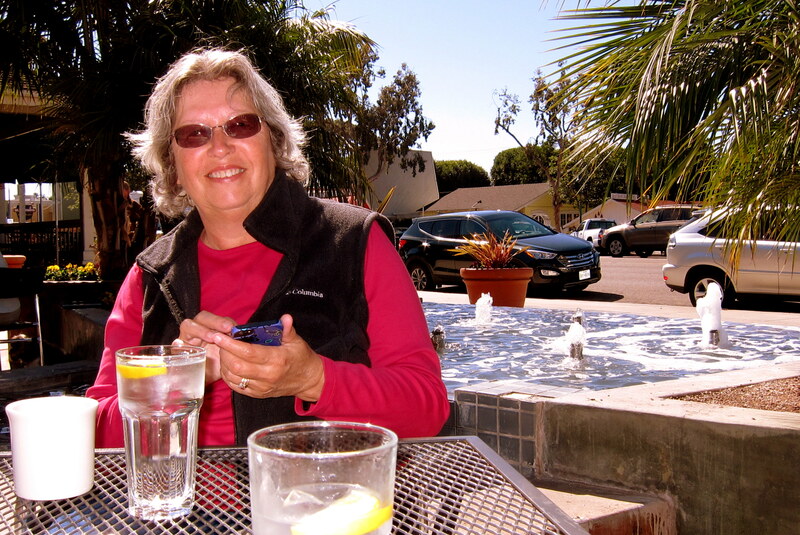 Since it was around noon, Kit and I met up for lunch via Text Messages at a local place called Saint Tropez where we had an excellent meal with Al Fresco……whoever he is. Continuing down the coast we stopped and explored a few more towns before reaching the Torrey Pines Glider port just north of La Jolla. 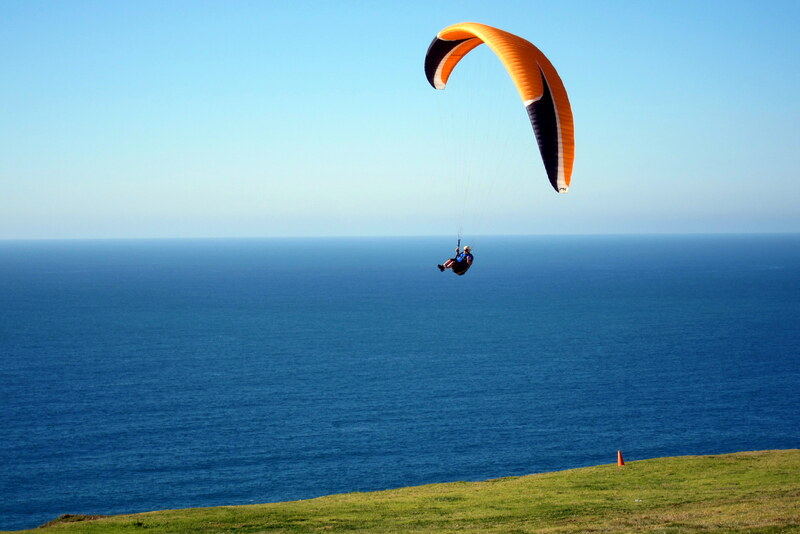 Kit was ready for a nap, so I walked out to the bluff overlooking the Pacific and watched pilots hurl themselves into the cliff induced updrafts wearing little more than Para-foil kites on their backs. It was mesmerizing watching them maneuver their wearable aircraft as they twisted and turned in the afternoon breeze. Looked to be a heck of a lot of fun! Wonder what one of those things cost and if the learning curve is very steep? After all I can now sorta successfully control a stunt kite from the ground. Shouldn’t be that much different…..well except for the potential bodily injury part. 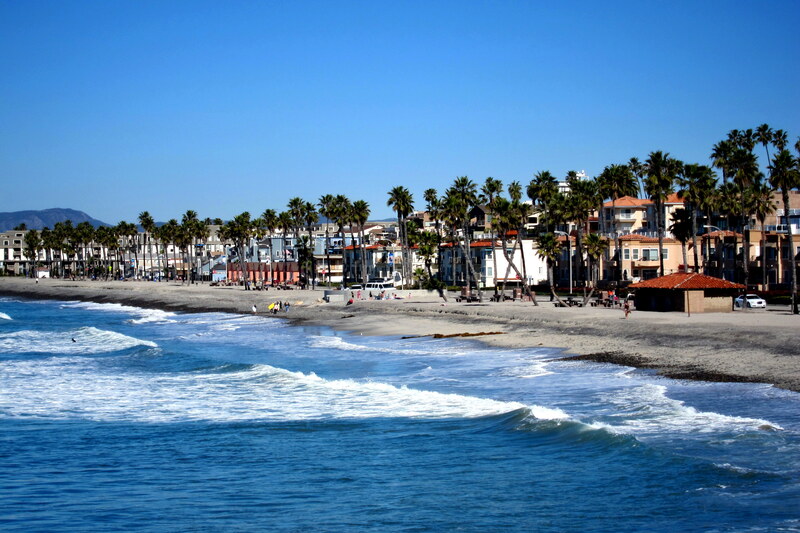 A few days later we decided to explore our host city of Oceanside. Kit wanted to spend some time at the library and I wanted to visit the beach, yea I know…..big surprise. Walking out on the Oceanside Pier, I spent time watching the surfers enjoy the shore break on this beautifully calm glassy morning. 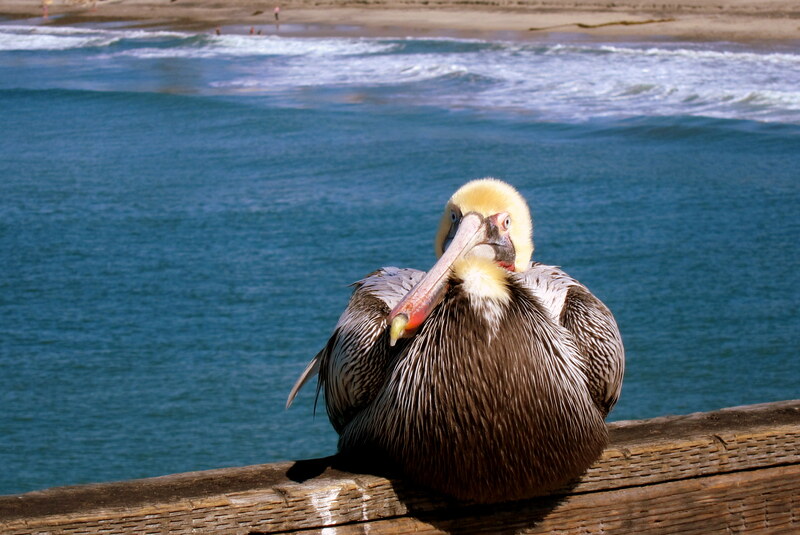 Then, as I approached the end of the pier, I came upon this fellow. Using a technique that Dave taught me I started snapping away with my camera as I inched ever closer. Soon, I was a mere two feet from the big fellow watching me as I watched him through the viewfinder. The Mexican standoff was settled when he abruptly stood to tower over me. This aggressive action caused me to hastily retreat to the far side of the pier and had it not been for the railing, I might have gone for an unplanned morning swim. 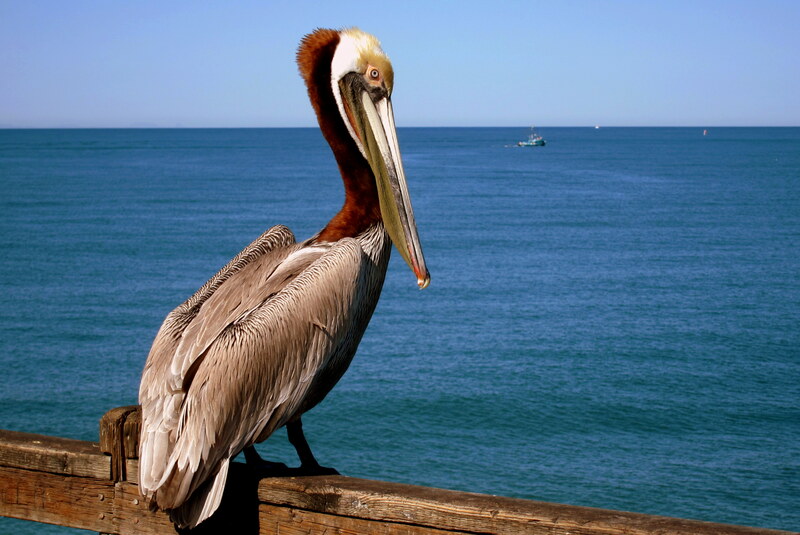 It was then that I realized that the pelican, and a few of his fine feathered friends, were local characters that sat about the pier and waited for one of the fishermen to drop his bait. Turns out the big fellow was pretty tame and obviously liked to pose. Walking back toward the library I stopped at the California Surfing Museum, a place I had visited and wrote about on previous trips. 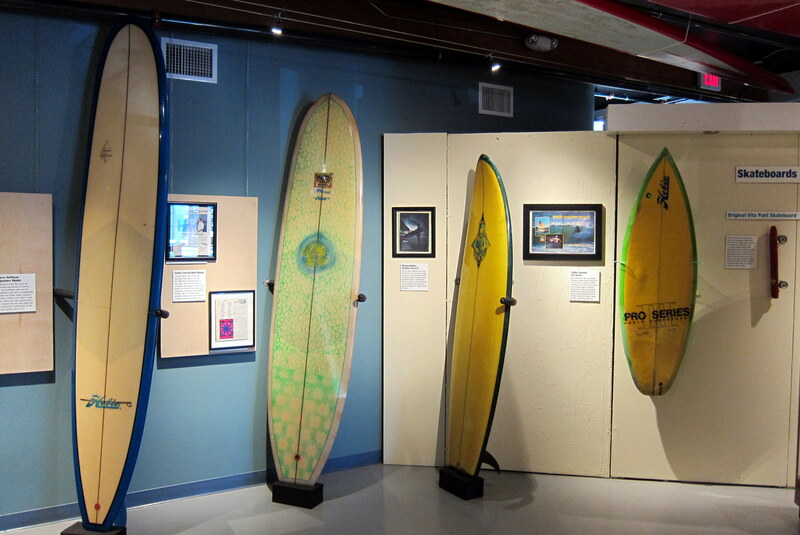 There were a few new exhibits this year that I wanted to check out, one of which chronicled the life of Hobie Alter, a surfboard pioneer from the early days. As young kid’s growing up on the beaches of California, my brother and I always lusted after a Hobie board but at over a hundred dollars a copy, they were just too expensive for our mother to afford. So, we did what many other local kids did back then…..we made copies of them out of discarded foam blocks, some fiberglass cloth and a few gallons of fiberglass resin. We even made the skegs in wood shop at school. Didn’t always look as nice as the factory boards, but they surfed almost as well. Another new and fascinating exhibit honored Bethany Hamilton, a young professional surfer that was attacked by a large shark severing her left arm just below the shoulder. The board and suit she wore that fateful day were featured in a story about the attack and her recovery. In a little over a month’s time, Bethany was back in the water overcoming her disability and eventually she returned to professional surfing. The above photo was taken from her website http://bethanyhamilton.com/about/bio/ where I would encourage you to visit and learn more about this remarkable young woman. A feature film has been made as well called “Soul Surfer”. Bethany was hired by the studio to consult on the film and do all the surfing shots for the actress that played her…..it’s a great movie, check it out! One morning at camp as I was watching the daily parade of Marine AAV’s, I noticed that our new neighbor had a unique motorhome that was powered by biodiesel. In addition I noticed an unusual “toy” hitched to the motorhome’s back bumper…..curious, I just had to do the neighborly thing and introduce myself and welcome him to the neighborhood! Turns out that Dusty has severe lung disease and uses the toy to help him stay mobile. He generously offered to give me a few riding lessons and then to give it a go. 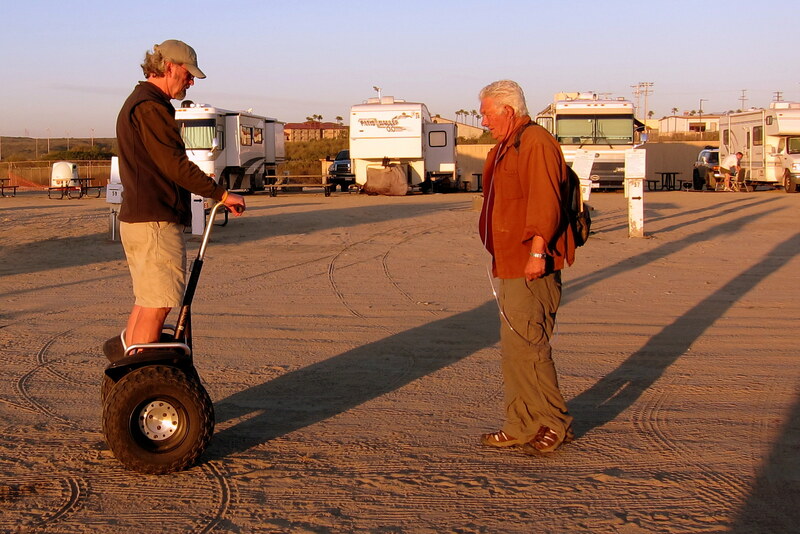 The toy is a Segway in off road trim and after a few false starts I was off and rolling about the campground at a pretty good clip. 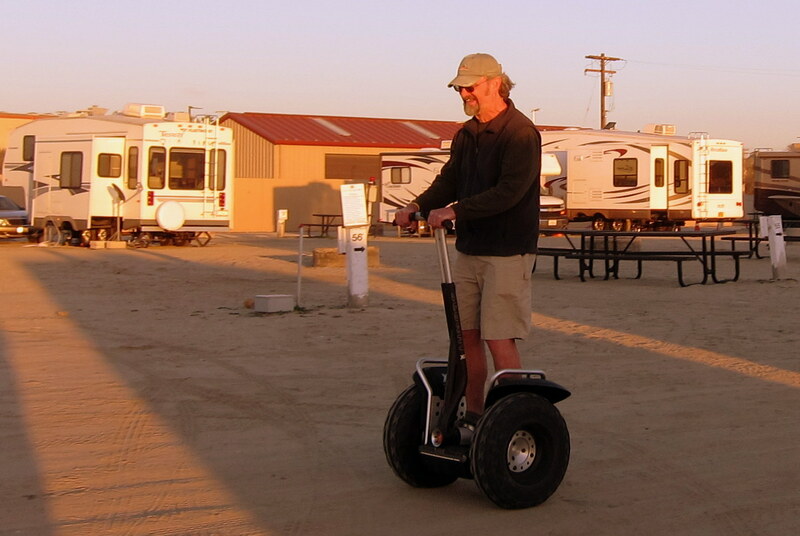 If you look carefully at the photo above you may be able to detect a pretty big grin…..the thing was a blast to ride! I want one!! As the sun set on another great camping week, we both vowed to return to this little slice of heaven in the future. Tuesday, February 26, 2013: Up and lounged about for a while before breaking camp. We took a last walk on the beach and then said goodbye to the neighbors. Bill a former Navy Chief Warrant Officer was on the opposite side of us. He started his military career on Swift Boats in Viet Nam and ended up with the amphibious force, retiring from ACU-5 as Officer in Charge of a division of Air Cushioned Landing Craft (LCAC’s). I was able to see these incredible machines operate offshore during our stay, but due to security was never able to get close enough for a photo, so I pulled this one off the US Navy website. Bill told me that the LCAC is usually embarked on an amphibious ship but can operate from a shore station as well. It can carry 40 tons of equipment from ship to shore at a speed of 40 knots then ride up the beach on its hovercraft hull to deposit its cargo. This thing would make an awesome houseboat!! Finally on the road at 1125 under clear warm skies. Today is our annual pilgrimage to Riverside National Cemetery to pay our respects to Kit’s Mom and Dad. Since this is to be another short mileage day, we decided to take US-395 through the backcountry. 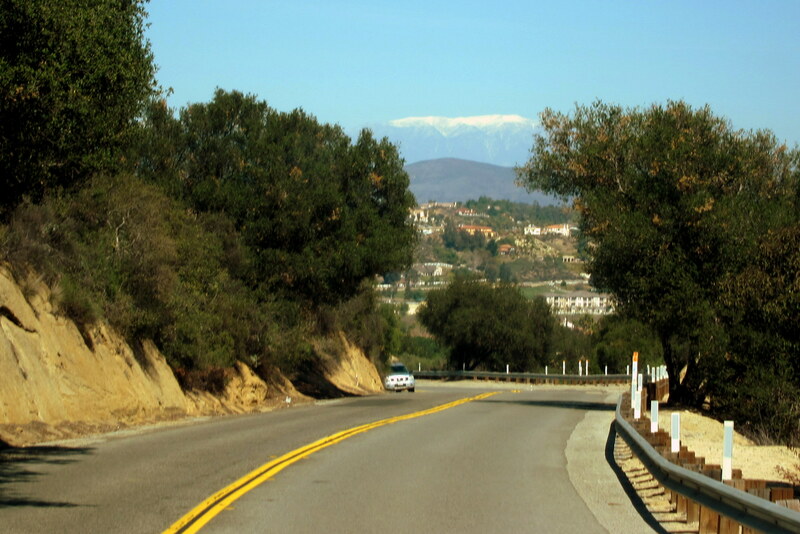 When one leaves the major metropolitan areas of California or moves inland a few miles the terrain and towns look like many rural places in the US. 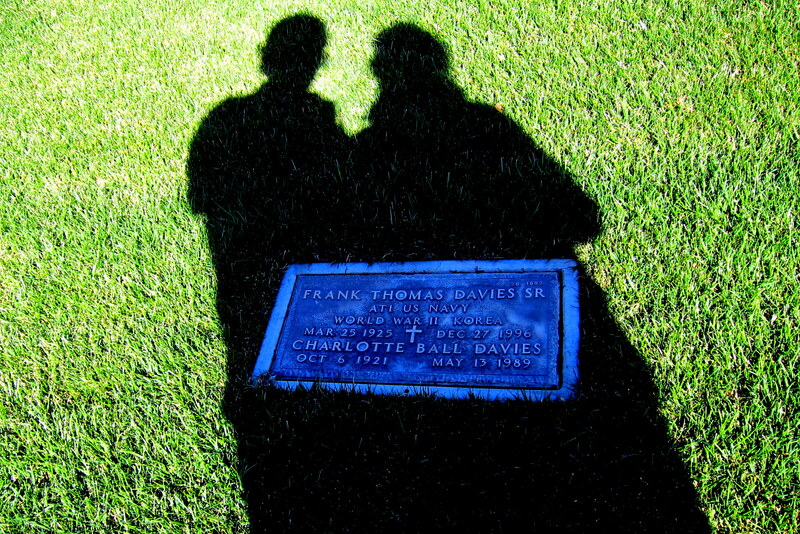 After four short hours on the road we pulled into the National Cemetery and spent a few minutes graveside remember Frank and Charlotte, two wonderful human beings. Leaving the cemetery, we stopped for the night at March Air Reserve Base just across the road and set up in a full hook-up site for the evening. 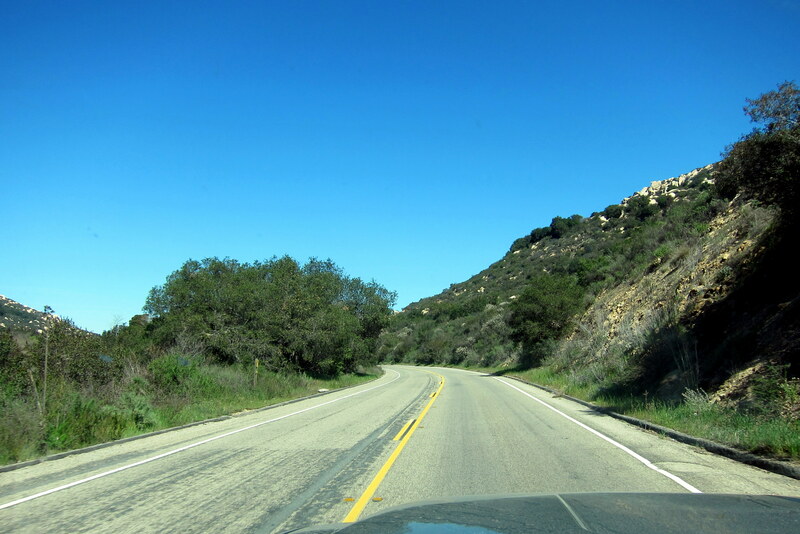 Wednesday, February 27, 2013: Up, broke camp and on the road at 0935. The sky is clear with temperatures in the 60’s. 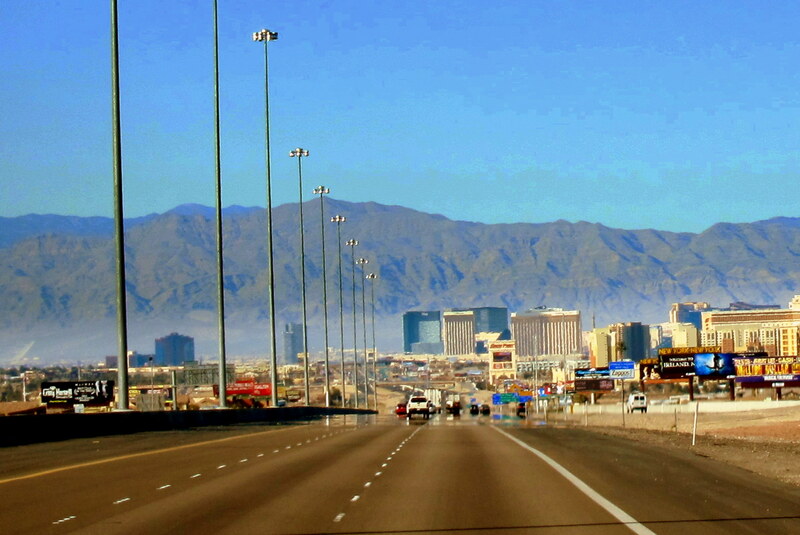 Today is a day we look forward to all trip…..a visit to our youngest daughter and her family in their current hometown of Las Vegas, Nevada. 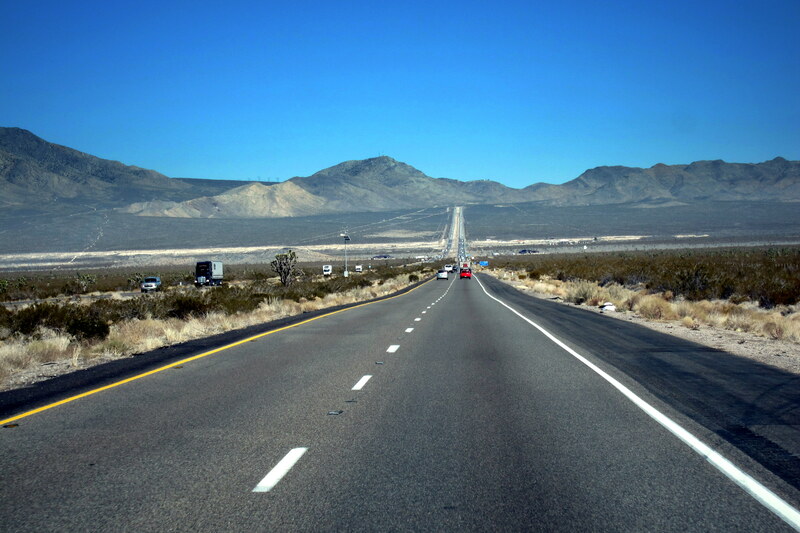 In order to make good time on today’s 235.83 mile trip, we decided to stick to the Interstate so on I-15 we motivated along at our customary 55 MPH while folks in a great hurry to lose money in Vegas were flying past at 85 MPH. This is desert folks, and a not very pretty desert at that…..nothing much of interest to see, do, or photograph for miles and miles. Well, we did come across this unusual sign. And spent hours looking at this view through the windshield. Before this image came into view. At which point we finally left the desolate ribbon of asphalt and made our way to the kid’s home south of town arriving at 1510. Since this is a work/school day, no one was home, so we set up in their dooryard and waited for this scene to unfold. Guma Kit was in her glory and the kiddles Jack and Tucker couldn’t get enough of her time. 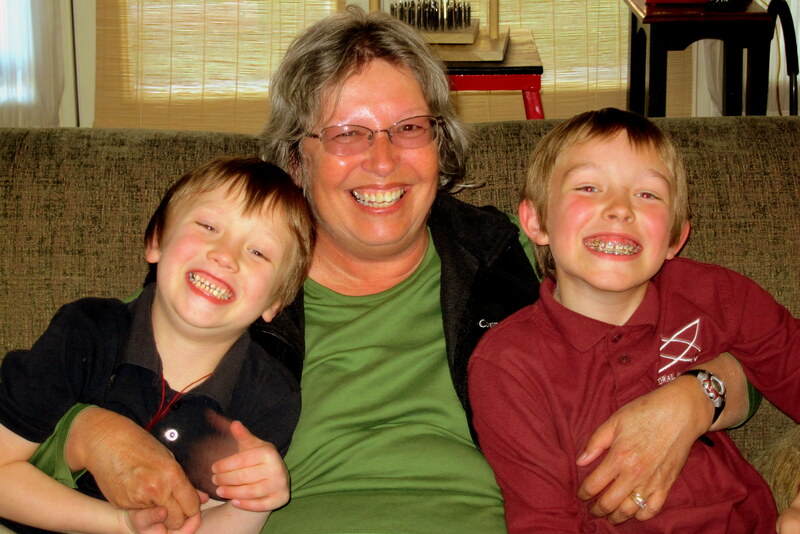 Gonna be a great grandkid spoiling couple of weeks…..stay tuned! Kit’s Corner: What a true delight to see Jack and Tucker again!!! These boys are growing up so fast. Seeing them only once or twice a year, we notice the changes so much more than if we saw them every couple of weeks. Can’t wait to have them with us on the weekends now, for a spell. With both of them in school, we focus mostly on having them Friday night till Sunday night. Great story as usual and great Brown Pelican shots. You have learned well Bill. Thanks Dave…..your sneak up while shooting technique has really paid dividends! Yep…..those were the days, I remember them fondly. We just took the grandkids to see the new film OZ, they loved it! I’m betting you know some of the actors in the film! 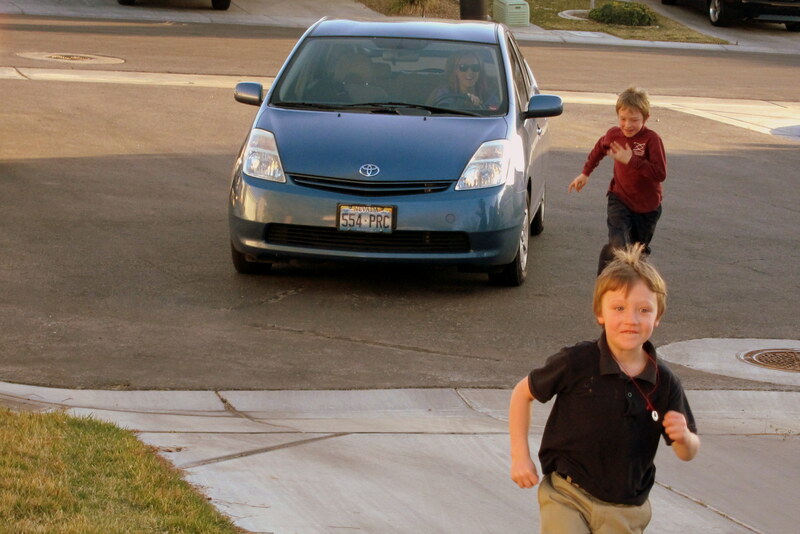 I don’t think any kids could smile any broader than Tucker and Jack are in these photos! Have a great time in Vegas with the crew. We’re counting down to our move…which is less than 2 weeks away. So anxious for a “real” kitchen and entertaining friends. Sandy’s best friend from high school who still lives in B-wick is moving (with her recently transferred husband) to the next town to us here in FL. Sandy is doing super…but you’ve probably already read that on her Caring Bridge page. Love ya! Thanks for the comment. We are sure you are liking your new place…..can’t wait to see it in person. Glad all is going well for you and your family…..Love ya! Great photos! 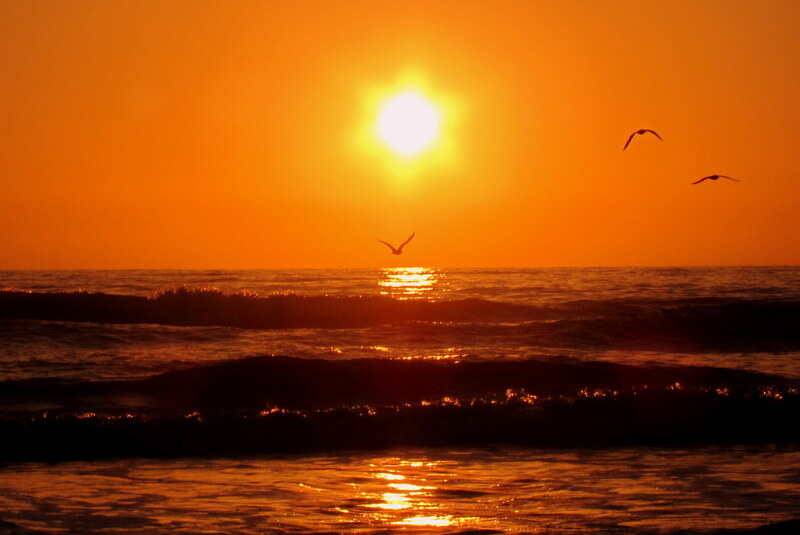 Much prettier scenes that what we see in Florida. I did manage a couple of lovely sunsets but pictures of alligators start to be boring. Hey, great to hear from you folks. I bet photos of alligators can get real exciting, real quick! Have a nice stay in sunny Florida and a safe trip home. SORRY FOR THE DELAY IN SENDING A REPLY. LITTLE NEWS DEVELOPES AROUND THESE PARTS IN MARCH. BEING I QUIT DRINKING BEER AND ONLY AN OCCASIONAL GLASS OF VINO, ST PADDY’S DAY CAME AND WENT WITH OUT SO MUCH AS AN ANGRY WORD WITH MY SPOUSE AND NO BIG HEAD. THE BAY IS/WAS OPEN FOR A SHORT WHILE AND THOUSANDS OF DUCKS AND GEESE HAVE ARRIVED EN ROUTE NORTH. THIS ALL CHANGED WHEN THE TEMPS DROPPED SUDDENLY AND THE BAY IS NOW PRETTY WELL BUTTONED UP. WE DID HAVE A BEAUTIFUL MINK VISIT THE OTHER DAY AND A WEASEL CAME SLINKING BY TODAY. I SUSPECT THAT YOU WILL SOON BE HEADING BACK TO GOD;S COUNTRY, DON’T HURRY, WE HAD 8/9 INCHES OF SNOW YESTERDAY. POOR JEANNE IS PRETTY SICK OF THIS SHOVELING..
STAY SAFE, LOVE THE JOURNALS. Hey buddy, great to hear news from home and always great to hear from you folks. We are slowly meandering our way easterly and should be back in Maine before the annual hot spell. Take care of yourselves!